So you own a business and you want to know more? 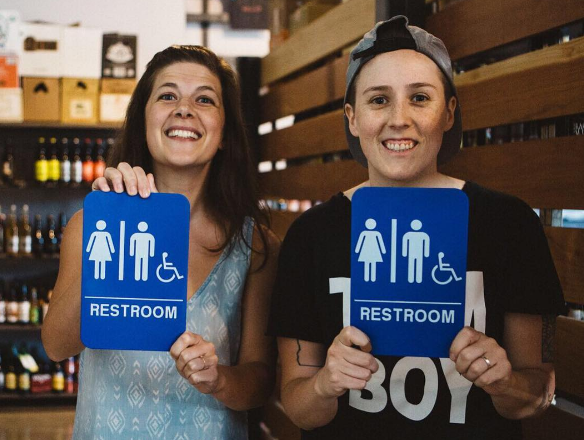 Taking the gender markers off those restrooms means safer spaces for all your customers & shorter lines, too! Check out this video we made featuring Lil Zee, which explains some of the benefits. Most cities and towns allow for this change without conflicting with building codes, so long as you are still following ADA Guidelines. To save you the headache, our team will do the research on your city to make sure you have all that you need to know! All you have to do is contact us here, and we will take it from there! No construction required! Popping those old gendered signs off and replacing them with unisex signs is the only change you need to make! You can get our custom signs here, and if you are working on a lower budget, you can get these signs from Amazon. If that is still out of your price range, contact us directly and we will work to raise the funds to sponsor your new signs free of charge. Another option is to make your own signs! We’ve seen some incredibly creative unisex restroom signs and love to post them up on our Instagram. Follow us for ideas and inspiration! Take the next step and learn more about non-binary gender identities! That makes a ton of sense, since this might be the first you are hearing about customers who don’t identify as male or female. Lucky for you, our founder Kristin Russo has been working in the LGBTQIA arena for her entire life and as a result, we’ve got a ton of info to send your way! Check out this list of links to start, and you’ll get the hang of it in no time at all. Last, but certainly not least, become an OUR Restroom Ambassador! 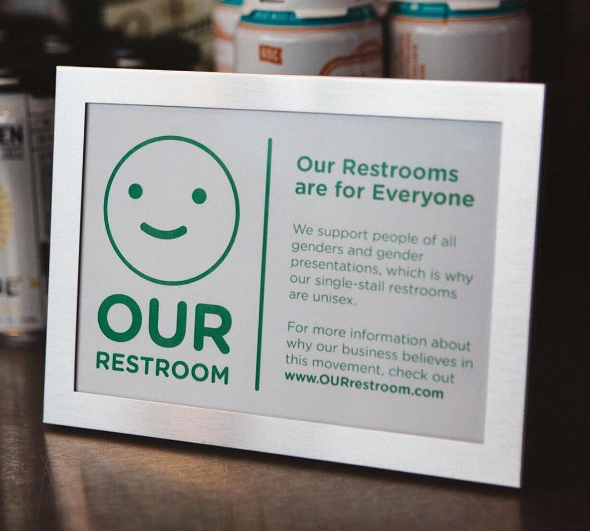 Becoming an OUR Restroom Ambassador means that you’ll get to tell your customers that you made this change because you believe in equal-access for all humans, which is pretty flipping amazing. Every OUR Restroom Ambassador gets one of these gorgeous letterpress signs to display as they choose, which explains why you’ve made this change!